I wore this a couple of days ago. It was a lovely sunny day, love the spring wind. 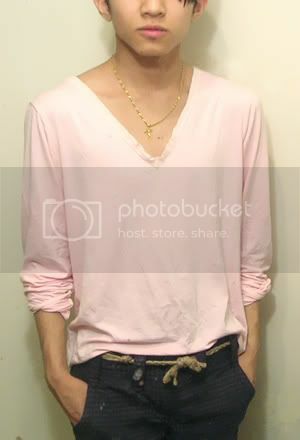 I dug this BananaRepublic pink long-sleeved v-neck tshirt from mom’s bag of old and to-be-thrown-away clothing. It was the most comfortable thing I can remember putting on, the fabric is very flow-y although you can see the neck line a little destroyed and loosen — WHICH i love because it looks very effortless and laid back. I tried it on and bam! it didn’t look too bad, I can still wear it. 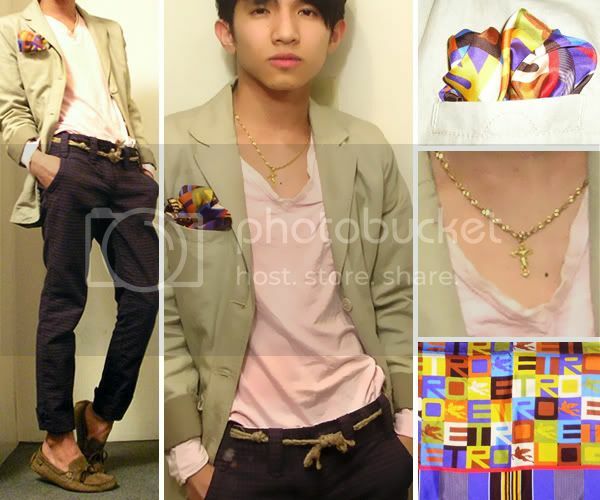 I paired it up with this purple trouser my sister own, and a belt made from recycled rope, linen Blazer from ZARA kids, suede boat shoes and a silk pocket square from Etro Milano which I think tied the whole look together. OH and I was wearing this gold necklace as well that my mom gave to me and my sister when we were very little, I haven’t worn it in years, I thought it was a good extra touch. I wished I was out in the sun, or by the beach taking picture with this outfit on… I just had to work that day and it sucked… but I get to go out, with the sun still so bright, on my break so I guess it wasn’t that bad. I was searching for images of Lanvin Spring 2009 beaded trompe l’oeil tee and accidentally stumbled upon your LOOKBOOK, which eventually directed me to your blog. Anyway your whole look is seriously amazing. Perfect styling! 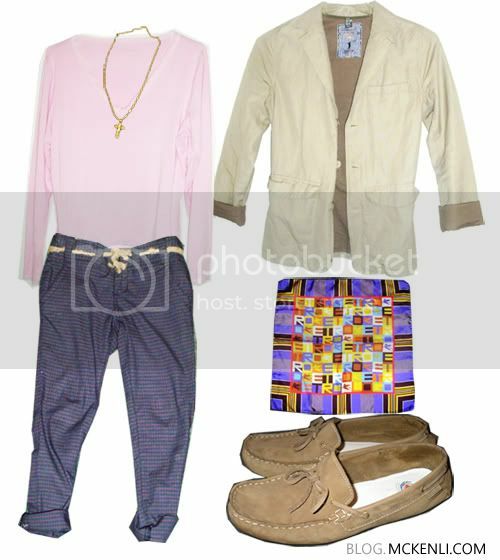 The pants, the pastel tone of the top half, the accessories (I like EVERYTHINg, boat shoes is my official footwear now). I like how you get inspired by the runway looks and really make the effort to make you own version. As for me I easily get excited by lookbooks but don’t have the balls to wear them out. Bravo I say! Oh yes, I’ve added you to my blogroll as well. ANTM & Project Runway Canada finale.